Thursday 8 March; 18:30 – 20:30 at No. 25 Fitzwilliam Place, Dublin 2. This is the third event, in its second year. 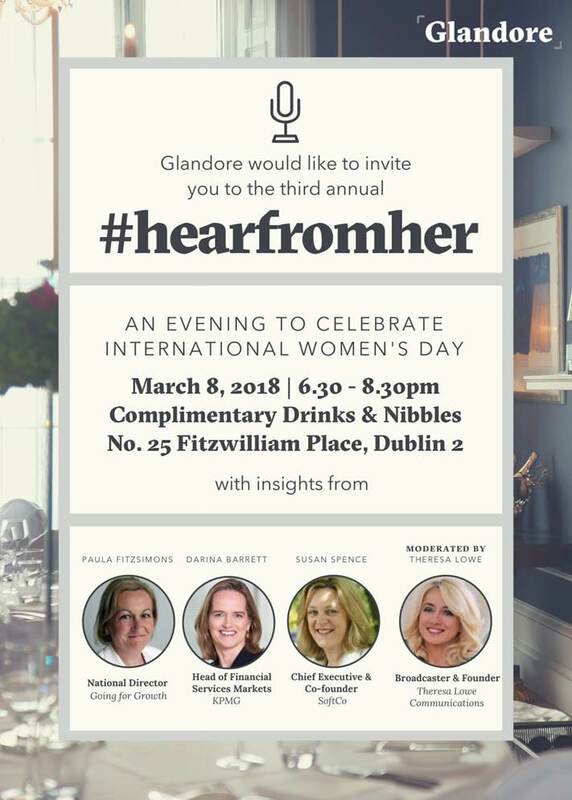 Glandore’s #HearfromHer started on International Women’s Day 2017, with close to 100 guests in attendance. As a female-led family business, we meet and work with inspirational, successful and motivational women every day. We wanted to hold an event that brought likeminded men and women together to meet each other and “hear from her”. There are so many women with amazing and exciting success stories that many people have not yet heard from. We also wanted to share those stories that people may not necessarily get a chance to ever hear. Those of struggles, challenges and hope. Guests can look forward to an exciting, engaging and informal evening to celebrate International Women’s Day 2018. Complimentary drinks and nibbles will be provided, as well as a panel discussion with four inspirational women, followed by networking and fun. We believe our Hear from Her events provide a wonderful opportunity for likeminded business people in Ireland to share their stories and make valuable connections. We would advise people to try to meet at least one person new on the evening. We also hope that “hearing from her” might encourage guests to feel empowered to share their own stories more. This event is invite-only, however we do welcome those who express interest in attending. We ask that people please contact [email protected] to register their interest.